Check out this website to read a selection of Holidays 4U reviews Azahara Playa, taken from third party websites such as TripAdvisor. Check out this website to read a selection of Holidays 4U reviews, taken from third party websites such as TripAdvisor. This is one of our latest reviews and was regarding this studio on Azahara Playa, which you can read more about by clicking on the photo on the left. The owner has furnished the apartment with a new king-size double bed and there is also satellite TV which includes some English channels. The apartment can sleep up to 3 people with a 3rd person on a z-bed provided. For this reason the studio is probably more suitable for 2 adults and 1 child under 12 years old. There is also a dining table and chairs and the kitchen is equipped with a microwave, hob, fridge, toaster and kettle etc. The apartment also has a security safe, where guests can safely store their valuables and passports. 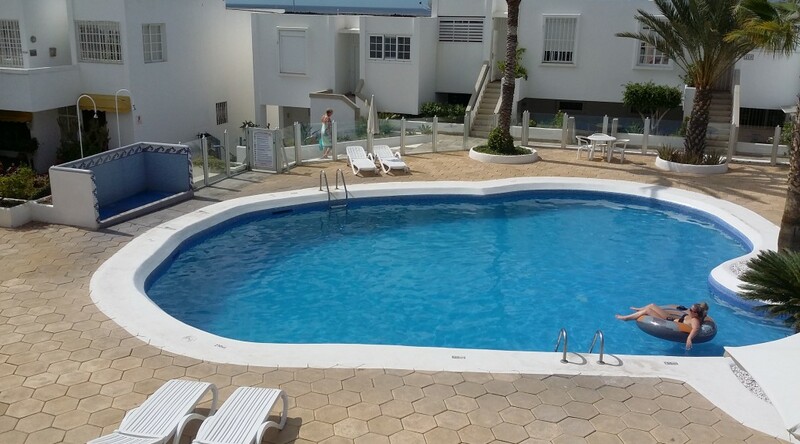 Outside the apartment balcony enjoys a small sea view as well as a view of the pool directly below the apartment. The balcony is furnished with a patio table and chairs and is perfect for enjoying a snack and a glass of wine in the sunshine or in the evening while watching the setting sun. As you will read from the review, our client stayed last New Year. The complex, Azahara is in a great location as it is situated close to the beach and is near to bars and restaurants. The pool is very well maintained. I will ask the owner to vote for a pool bar at the next Community meeting. We always try our best to organise every holiday with great care and attention. And we only offer the best quality accommodation. It is so nice when our efforts are appreciated. Selection of holiday reviews of Holidays 4U.